These are pages from Blake's illustrated book Songs of Innocence. The artist composed the verse and designed and printed the pages. He developed a technique for integrating both text and image onto a single etching plate for printing. This reflects the intimate relationship he saw between image and text, each being a comment upon the other. The influence of Blake's work as a writer and illustrator persisted, and he became an important model for modern artists such as Paul Nash. LITERATURE Keynes Bibliography 1921, pp.114–28; Erdman Illuminated Blake 1974, pp.41–97, book repr. ; Bentley Blake Books 1977, pp.364–432 no.139 (Tate works pp.371, 430); Bindman Graphic Works 1978, pp.468–9 nos.40–70, 474 nos.214–69, two books repr. Blake published his Songs of Innocence on their own in 1789. In his prospectus To the Public of 10 October 1793 he advertised both Songs of Innocence and, as a separate item, Songs of Experience; however the separate title-page for Songs of Experience is dated 1794 (Keynes Writings 1957, p.208). Most though not all of the existing copies of Songs of Experience are bound up with Songs of Innocence with a joint titlepage reading Songs of Innocence and of Experience Shewing the Two Contrary States of the Human Soul; this is undated. 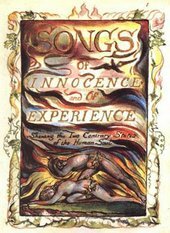 In some of these joint copies certain poems originally included in Songs of Innocence are moved to Songs of Experience. Even within the two sets, the order of the poems was frequently altered. A00037 is watermarked ‘1831’ and, as all these pages show the same palish grey inking and type of paper, all were presumably printed after Blake's death in 1827, probably by Frederick Tatham from the plates that Mrs Blake would have brought with her when she went to stay with him in September 1828, though not necessarily before her death on 18 October 1831. These works were formerly inventoried as nos.3694 vii, viii, vi, v, va and iv respectively. This is the first of two pages devoted to this poem and normally occur as page 25 in copies of Songs of Innocence and as page 22 in the combined Songs of Innocence and of Experience. For the rest of the poem see Erdman 1974, Bindman 1978 or Keynes Writings 1957, p.123.